The nine-millimetre Browning semi-automatic pistol used by the Canadian Armed Forces is a technically impressive weapon. It was conceived by American John Browning for Belgium’s Fabrique National in 1911, and has been used by more than 50 militaries over the decades as it was continually refined. 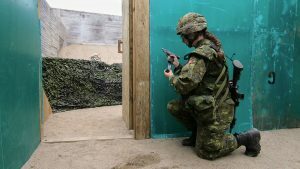 But a replacement is desperately required, according to the Canadian Army’s General Service Pistol Replacement project director. Production of the Browning, which began in 1935, finally ended in 2017, and parts for in-service weapons are no longer available. Repairs to in-service weapons mean that Colt Canada, the government’s Strategic Source and Centre of Excellence for Small Arms, must cannibalize others. Some 30 percent of each batch is scrapped and stripped of serviceable parts. Hence the Army’s need for a sidearm better suited to personal protection when the service rifle is not adequate or available in constrained close-quarter situations in increasingly urban theatres of operation. 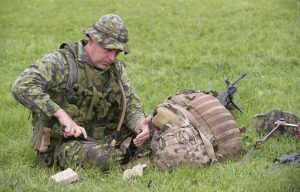 A General Service Pistol (GSP) replacement project is now in the hands of Major Carl Gendron, a member of the Royal 22e Regiment. His formal title is project director for the Director of Land Requirements 5-1 (Infantry Weapons). Gendron brought operational chops to the job. Having joined the Reserves in 1985, he went Regular Force in 1990 and was deployed immediately after training to support the “Oka crisis” in Quebec. The Royal 22nd were key to a peaceful resolution after a tense stand-off. He also deployed to Bosnia, Egypt, Afghanistan and, finally, the Republic of the Congo in 2012. Some might say it was just as well he didn’t have to fire his Browning because no matter how well maintained, they are seriously problematic. “The bottom line is that we don’t have a sufficiently reliable General Service Pistol,” Gendron acknowledged. Troops who are deployed, but part of a formed unit, usually are issued a pistol in-theatre from the operation’s stock of spares. Just how unreliable is the Browning? Evidently the only recent solid data comes from a Canadian team at an international competition. During the 2017 Armed Forces Skill at Arms at the Robinson Maneuver Training Center in North Little Rock, Arkansas, only five of 20 Brownings taken to the event by the CAF’s best shooters were used due to an unacceptable number of stoppages. The other 15 were withdrawn during warmup. Canada’s 10-member team had an average of 4.5 stoppages each while firing a total of 2,810 rounds. As a comparison, the 20-member British team had absolutely no stoppages while firing 5,620 rounds. 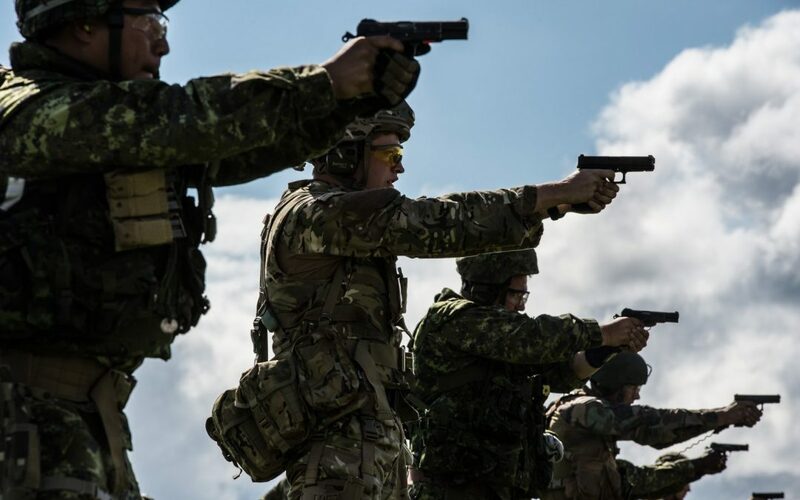 Against a generally-accepted mean of 5,000 rounds between stoppages for new service pistols, the CAF experienced a much higher percentage above normal. Before a deployment with the potential for combat, weapons technicians run the pistols through a series of checks to determine whether an overhaul is needed. Even if it is, with the aforementioned cannibalization, “you’re not getting a new pistol; in the end, you’re getting one that inevitably fails early,” Gendron noted. There’s no gainsaying the fact that the federal government has repeatedly said the CAF must be suitably equipped for a broad range of missions. Both the current government’s defence policy, Strong, Secure, Engaged, and the previous government’s Canada First Defence Strategy made commitments for “fully funded” and “predictable funding” for combat-ready capability, though neither specifically mentioned the well-known need for new pistols. The concept of involving political oversight (or political interest) in a relatively small defence procurement wouldn’t be unprecedented. When former Prime Minister Stephen Harper took a personal interest in replacing the Canadian Rangers’ decades-old Lee-Enfield rifles in August 2014, the procurement suddenly lurched into high gear. The result was that by April 2018 the Rangers had the new Colt Canada C-19 .308s, produced under licence from its Finnish developer, SAKO, part of Beretta Holding S.p.A. in Italy. While the Canadian Army has the GSP program for replacing its Brownings in all Commands, this is on pause for now because funding hasn’t been approved. So Gendron is managing an Army Interim Pistol (AIP) project which is expected to sustain Army capability for up to 10 years, until the GSP project can plug the entire capability gap resulting from the Brownings’ withdrawal. With an approved budget of just under $5 million, taxes included, the AIP project ostensibly mandates the purchase of 4,738 sidearms, including 508 for depot retention, all deemed “critical to meet the operational capability requirement of Regular Force units.” But SSE also highlights support for the Reserves, which would boost the overall buy to 7,627 once 2,580 are added for the Reserves and 309 for depot inventory. This, however, represents only about half of the pistols currently allocated to the entire CAF. Current defence policy means that the CAF must be ready to have 6,500-7,000 personnel simultaneously deployed on operations with another 5,000-6,000 in pre-deployment. The majority of deployed personnel are usually Army and critical equipment must be on-hand before engaging in their pre-deployment training. A request for proposals (RFP) had been expected in September, but progress is slow on what many in the CAF consider a critical and long-overdue acquisition. Although the Army has already approved the funding and requirement, “everybody else has to agree that this is going to happen,” said Gendron. Which pistol will it be? Other than the fact it will fire NATO-standard 9mm ammunition, it’s anyone’s guess for now. There are several potential contenders, including pistols from major manufacturers such as Beretta, Glock, Heckler & Koch, Sig Sauer and Smith & Wesson, just to name a few. One requirement for the new weapon is that it fit 95 percent of CAF users. The advent of polymer structures means that the eventual supplier would provide three grip sizes. There have been suggestions that the Sig Sauer P320, variants of which were chosen by the U.S. Army in 2017 as a replacement for the Beretta M9s it introduced in 1986, could be an option for Canada. Gendron admitted that “we’re watching this because it has most of the technology we’re looking for,” but he insisted there is no formal preferences and other pistols have potential to meet the requirements. The 1.1-kilogram sidearm pistol, which has an effective 25-metre range, consists of a barrel, a slide, a breech block, a frame, and a 13-round magazine. The latter’s capacity, nearly twice that of contemporary American and German designs, is why it’s often called the “Browning High Power” even in non-anglophone circles, including within its manufacturer, Fabrique National. A weakness, if it can be called that, of the Browning is that it’s a single-action. Unlike modern double-action semi-automatics, its trigger is not connected to the hammer. If a double-action pistol is carried with the hammer down, a loaded magazine and a round in the chamber, all it takes to fire is a pull on the trigger or a pull-back on the hammer and then a trigger-pull. Single-action pistols can only be fired when the hammer is cocked. Accordingly, the Browning is typically carried with the hammer cocked, a round in the chamber and the safety catch on; this is called “cocked and locked” by the United States Army or “made ready” by the British. Its ambidextrous safety is another problem, even for right-handed shooters who have a high grip. The bulbous end of the safety can wear into knuckles. And, finally, the “iron” sights on the Browning remain unadjustable, never having never been upgraded as other manufacturers have moved on technologically. Let’s hope the PM/PD will have included a rigorous user trial conducted by an independent agency, such as Gagetown’s Army Trials and Evaluation Unit, to assist in the decision of which of the contenders to ultimately select as the AIP. In the mid-70s I remember training [for a whole morning] with the High Powers and marveled at how sloppy the action was.If you shook the thing it sounded like a bag of hubcaps. $50 million for pistol procurement is insane, just buy the Glock 17 and be done with all the drama. There’s a reason 60% of law enforcement carry a Glock and untold military units worldwide use a Glock. They weren’t that way when they were newer. The problem with these is simply that they are old. The Hi Power itself is and was a great pistol, but any pistol that’s physically been in service for as long as these examples were will have problems. There is not much that goes wrong with the HiPower, most failures are magazine, ammo and user maintenance related. Browning only discontinued making the pistol a year or so ago. A Turkish company has picked up production making stainless versions. Companies do not like it due to the machining costs vs cheaper modern pistols with higher profit margins. Few pistols made today will last as long as the HiPower. The older Sig Sauer P226 made the Sig name for dependability and accuracy. The most likely replacement is an all metal pistol with exposed hammer. The Browning HP “was” a good pistol. Out of 45 pistol we have at my unit to train members deploying, only 7 won’t be affected by stoppages. The other 38 have stoppages with every magazine. they are worn out. Slide locking lever popping out as you fire them (locking lever slide opening on the slide are worn in an angle which pushes the lever out as it fires. Trigger pin moving out. Loose ejectors (failure to eject). Magazine disconnect vs old magazines, older than me (failure to fire). The P226 is an excellent pistol with a unique advantage, it can be decoked and re-holstered. I would not thrust a Browning loaded and ready with the safety in my holster. The safety are worn out just like the rest of the pistol and would disengage on its own. I think the biggest advantage of Glock is the price certainly not the “polymer” (durability)largely used in today’s pistol fabrication. Get the newest SS. We had the 226 SS in the navy and Special Forces have/had the 230 SS (bigger mag). Fine weapon, many have trained on it and used it combat. That’s good enough. Get the sonafabitch and get ‘er done.